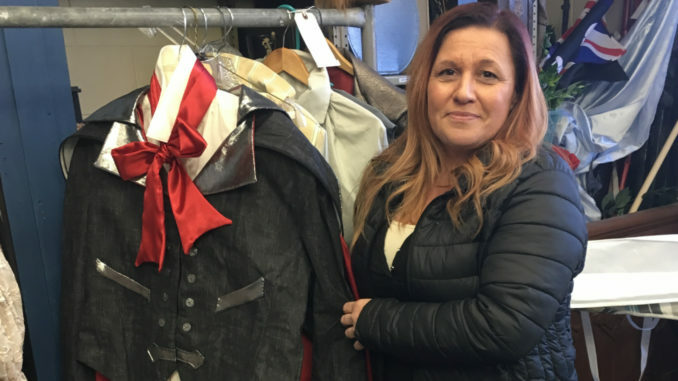 Lisa Bonelli standing with Pirelli’s costume from the upcoming production of Sweeney Todd. Lisa Bonelli, the new Technical Theater Director, is making sure the tech students learn some serious life skills. Several months after her son was born in 1998, Ms. Bonelli was looking for a hobby she could do at home. At age 28 she asked her mother to teach her how to sew. That pivotal decision would shape her career for the next two decades. Lisa and her mother worked on their sewing together, learning to make a variety of products. Eventually, they began selling their wares at craft fairs before finally buying a storefront for their goods. The business, Simply Unique, sold their handmade gifts as well as rotating consignment sales of everything from baby items to jams and jellies. Four years later, Simply Unique began accepting alterations and tailoring jobs as well. Over the course of the next few years, the store offered less and less handmade goods as the business became all tailoring. Ms. Bonelli was taking orders full-time after her mother was elected to a local councilwoman position. Then she made another life-changing decision: to take a costuming and wardrobe design course at FIT (Fashion Institute of Technology). She passed the store on to her daughter, similar to how she had shared it with her own mother. With her new qualifications, she was able to pick up jobs around the area. One day, Sherman Playhouse called with an offer to make the cushions for the seats. She happened to be present just as they needed help with costumes for the next show. This is how the theater tech career she’d dreamed of since attending FIT was set in motion. While doing the next seven to eight shows with the Playhouse, Lisa watched from the audience during rehearsals, interested in all aspects of the production. Mr. Frome, Canterbury’s Technical Theater Director last fall, recommended her for a costuming position here on the hilltop. When he decided to leave, she was asked to take over the position. Since she has always done building, woodwork, and electrical work for herself, she is now able to these skills on to the students. Ms.Bonelli hit it off immediately with Mrs. Armstrong and Mrs. Mathewson. Together, they worked to turn the Green Room into a welcoming space for students, with new paint and floors. Having little experience teaching sewing, Ms. Bonelli was nervous about mentoring a team of students. However, she quickly came to love the uplifting environment and the kids. The energy and excitement of her costuming job in Peter and the Starcatcher is what convinced her to stay. Her teaching philosophy is to guide kids, but give them space to do things themselves, to make mistakes, and then learn from them. She takes care of the smaller jobs and leaves the big ones for the crew. For instance, the tech crew of Peter was surprised to learn they’d all be sewing the costumes. By the end, however, each person had constructed a mermaid costume from scratch – wig, tail, and all. Looking to the future, Ms. Bonelli is excited to see everyone’s hard work pay off in Sweeney Todd. In her second show as the head of tech, she is having the crew hand-make more things than they buy. The team was especially excited to construct birdcages taken from an instructional YouTube video.